Very nice, ribbed wool 3 piece suit consisting of a cutaway jacket, vest, and buckle back pants. The jacket is lined with black cotton sateen, except for the sleeves, which are lined with a blue and white striped cotton. 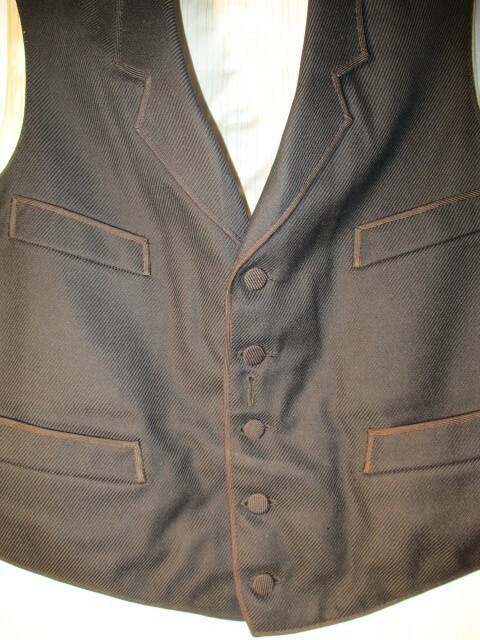 The vest and inside waist of the pants are lined with the same blue and white fabric. The vest is backed with black sateen, the buckle incised "Patent, March 13, 1888". 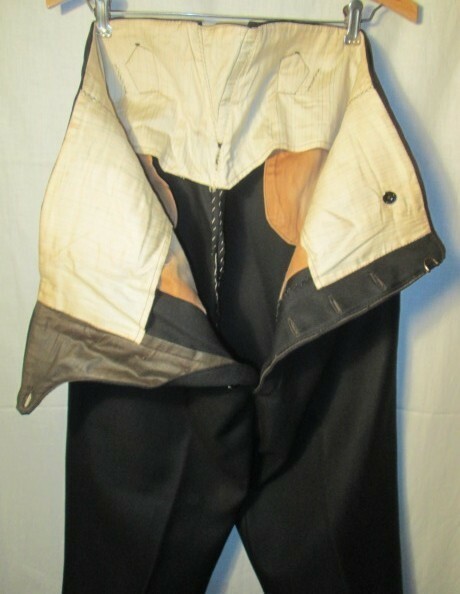 Both jacket and vest are edged with brown silk twilled tape along the edges and pockets. The pants are lined at the waistband. The jacket has two self covered fabric buttons, one chest pocket outside, two pockets inside at the chest, two inside pockets at the tails. 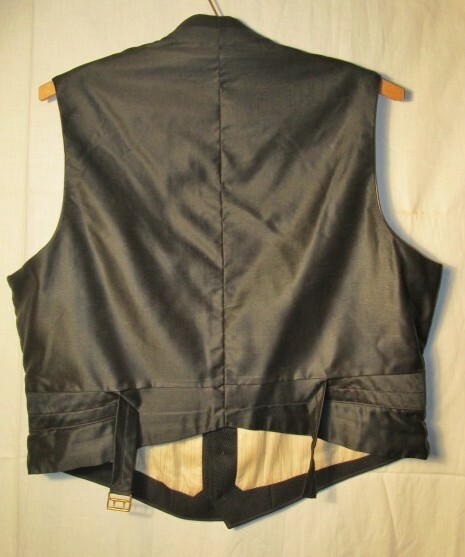 There is black seam binding and 3 buttons at each sleeve. 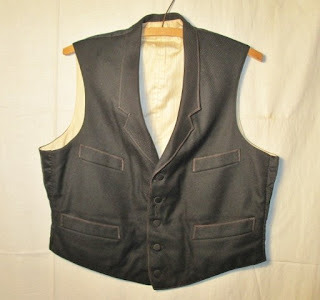 The vest has 4 pockets, five self covered fabric buttons, front pockets are lined with velveteen. 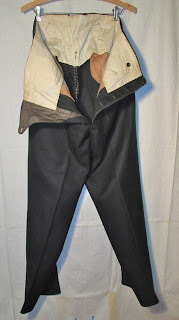 The pants have a flared leg, with a stiff cotton band at the inside cuff to reinforce. Buttons are Solide, the buckle in back is also marked Solide. 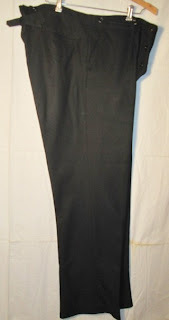 There is a gusset in back, the back pockets are curved, the side pockets also have a slight curve along the edge. 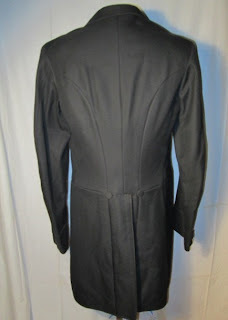 The jacket measures 41" around at the chest, 15 1/2" between the shoulder seams in back, sleeve is 27" long, measured from the top to the wrist. It's 35" long from the collar seam to the bottom edge. 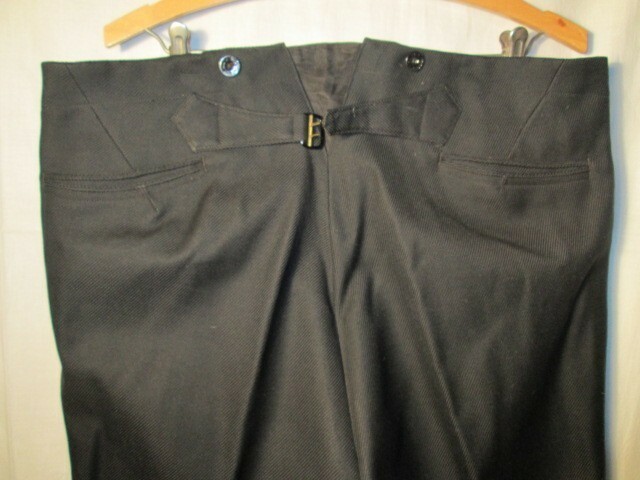 The pants have a 37" waist, 42 " hem, 30" inseam. The vest has an approximately 1" insert at each side which seems to have been added later, though the fabric matches the backing. It measures 43" around at the chest, is 21" long measured in back. Please note that these are outside measurements. The jacket has one button with fraying along the edges, one tiny hole at the back towards the waist, the slightest, 1/2" area with minor fray at one wrist, this is hard to spot. There is some minor discoloration to the sleeve lining. The vest has some water type or age staining towards the front and back shoulder area, no splits, weak areas, or holes. The pants have some discoloration to the lining and pockets, a few of the waistband buttons have some paint loss. 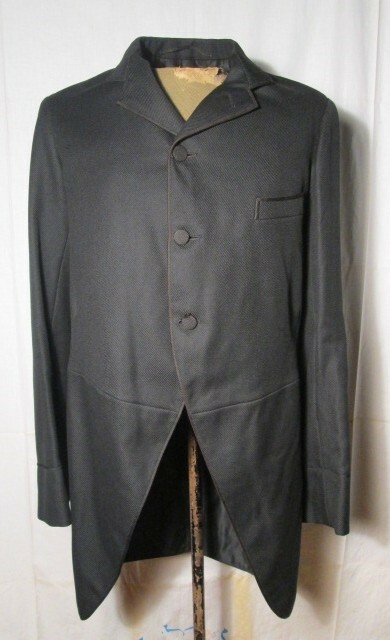 A very well made, substantial suit, in just about a good a condition as you will find. There is little or no shininess, fading, or matting to the ribbed fabric. First, the person that asked that question at the end needs to be re-educated, badly. 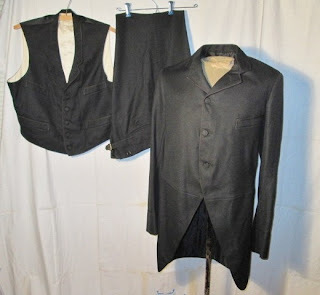 We do not wear 120+ year old suits, period. Think of clothing as a skin. When you are 120 years old, your skin is quite delicate and very different from when you were born or even middle aged. Second, I think this is probably a couple of years later than the buckle date. Here is a fashion plate from 1891 showing a very similar jacket cut.